Recommended citation: Alfaro AJ, Argüelles-Borge S, Stripling AM, Brochu PM. The Positive Power of Perception in Late Life: A Study on Subjective Aging and Health among Ethnic Minorities. OBM Geriatrics 2019;3(1):16; doi:10.21926/obm.geriatr.1901043. Background: The world’s aging population is growing and diversifying at an unprecedented rate. In preparation for this, the National Institutes of Health and the Centers for Disease Control and Prevention have issued calls to improve the overall health of older adults. A promising avenue of research to improve health in late life has been dedicated to subjective aging; the way people perceive their own aging process. The main objective of this empirical study was to investigate subjective aging in late life among ethnic minorities in the United States. Specifically, this socio-historic study examined age identity, or how old one feels, in relation to psychological well-being and functional health. Methods: This study utilized data from the Midlife Development in the United States Study (MIDUS), Survey of Minority Groups. Results: Results indicated the sampled population predominately reported a younger age identity, that is, felt younger than their actual age with higher age related to great discrepancy between felt and actual age. Although there were no differences in aging identity among specific ethnic backgrounds or levels of education, gender-related differences were found with men feeling younger than women. Another key finding was that younger age identity predicted higher levels of psychological well-being and functional health. Lastly, psychological well-being mediated the association between age identity and functional health, even while controlling for age and gender. Conclusions: These findings contribute to the literature by extending previous research on subjective aging and health to ethnic minorities. Moreover, these results have clinical and research implications for professionals in the field of geriatrics. The world’s aging population is growing at an unprecedented rate. In 2010, 8 percent of the world’s population was aged 65 or older . By 2050, it is expected to nearly double to 16 percent . In a like manner, the United States Census Bureau reported that in 2030 one in every five Americans is projected to be retirement age . By 2060, older adults are predictable to make up nearly one-quarter of the population . Largely caused by the aging of the baby boomers, this rapid growth will inevitably create a demographic shift in our nation. In preparation for this, the National Institutes of Health (NIH) and the Center for Disease Control and Prevention (CDC) issued a call for action to improve the overall health of older adults living in the United States . In order to prepare for this foreseeable demand in geriatric care, it is important to take into account the ethnic and cultural diversity of our nation’s aging population. The growth of older Americans defined as “minority” by the federal government (including African American, Hispanic or Latino, American Indian and Alaska Native, and Asian and Pacific Islanders) is projected to grow more rapidly than the non-Hispanic white population of older Americans throughout the next half century . By mid-century, one-third of older Americans are projected to be from a minority population . Consequently, the U.S. health care system has coined the term “ethnogeriatric imperative” to foreshadow the challenges of serving the fast-growing segment of ethnic minorities in late life . As the United States continues to diversify, a commitment to cultural context needs to be more explicitly included in gerontological theories and research. A promising avenue of research to improve health in late life has been dedicated to subjective aging, the way people perceive their own aging process . According to Ryff, experiences of subjective aging and a person’s awareness of aging are integral psychological processes of the aging self . How a person understands and attributes meaning to their own aging process is a specific form of self-knowledge that may contribute to how individuals prevent and cope with illness in later life [8,9]. More compelling evidence revealed that subjective aging is better at predicting psychological and physical functioning than one’s actual age [10,11,12,13]. Given these points, successful aging is largely subjective, and is a concept that has sparked empirical interest in the fields of social gerontology, life span psychology, and life course sociology . Subjective aging is a broad concept that has been conceptualized in several different ways in the research literature. Two terms commonly used are self-perceptions of aging and age identity . Self-perceptions of aging refer to a general evaluation of how aging experiences are interpreted, and is often associated with satisfaction towards aging [9,13]. More specifically, age identity (AI) numerically captures the difference between one’s chronological age and one’s felt age, and is traditionally assessed by asking a person “how old do you feel?” [10,14]. Overall, the subjective aging literature has postulated that feeling younger and having positive representations of one’s own aging process are both associated with better physical and psychological functioning in aging individuals [8,9]. Although it is undisputable that the most objective measure of aging is age itself, the cultural maxim “age is nothing but a number” reveals a societal consensus that downplays the significance of a person’s chronological age. Several lines of research support this consensus by showing that across the lifespan, the discrepancy between subjective and chronological age accelerates [15,16]. For example, a cross-sectional Danish study found that younger respondents felt older and older respondents felt younger . Respondents 40 years and older reported they felt younger (roughly 20% younger) than their actual age . This trend was also seen in the Berlin Aging study, where 6-year longitudinal data revealed that on average, adults aged 70 years and older felt about 13 years younger than their actual age over time . In short, the ability to maintain positive self-perceptions of aging, such as feeling young, appears to be central to psychosocial adjustment throughout life [17,20,21]. Subjective aging is thought to be shaped by both individual and sociocultural factors [6,9]. Based on the classical theories about the self and identity, two self-motivating processes may be at work in shaping age identities: Self-consistency, the motive to remain the same stable person, and self-enhancement, the motive to maintain a positive self-image over time [7,22]. From this developmental perspective, feeling younger than one’s actual age is the result of an assimilation process that maintains an existing identity. According to Westerhof and Wurm, “individuals are able to maintain consistency in late life by integrating new experiences into their existing self-concepts and thereby identifying with the younger age they used to be”  (pg. 148). In youth-centered cultures like the United States, aging is seen as threating to an individuals’ self-concept, therefore identifying with younger age groups can help maintain a consistent and positive self-concept [21,23]. Sneed and Whitbourne deemed this as an assimilative strategy in terms of lifespan identity processes . In a similar fashion, the discrepancy in age and felt age in late life can be understood as a self-enhancing strategy through the lens of age-denial theory . This view postulated that denial of aging is a defense by which aging adults can dissociate themselves from the stigma related to growing old . Living in an ageist environment can have debilitating effects on older adults as evidence by Levy who found that older adults who were primed with negative stereotypes of old age performed worse on memory tasks, handwriting, and walking compared to those primed with positive stereotypes . Therefore, resisting the internalization of ageist stereotypes by feeling younger can compensate for the negative implications of ageism . In spite of the differences in terminology, these theoretical explanations converge on the premise that subjective aging is an adaptive strategy in growing old . On the sociocultural level, mass media, social policies, societal institutions, and cultural values are considered . A tendency to report a youthful subjective age is more common in Western societies where youth is celebrated and growing old is stigmatized [20,26]. For example, two studies that compared the United States to Finland and to Japan found that the discrepancy between felt age and chronological age was larger among Americans [27,28]. Similarly, Westerhof, Barrett, and Steverink found that compared to Germans, Americans maintained more youthful identities, particularly at older ages . Moreover, a cross-cultural study of Americans and Dutch persons aged 40 to 85 revealed that the self-enhancing function of youthful and positive aging perceptions was stronger in America than in the Netherlands . Building on these empirical findings, one can conclude that positive perceptions of aging have a stronger impact and higher adaptive value in cultures that favor youthfulness to a greater degree like in Western societies. In summary, the way individuals perceive their aging is an intricate process involving personal experiences, social interactions, cultural values, and societal structures . Therefore, it is prudent to take individual and sociocultural contexts into account when examining subjective aging. Moreover, feeling younger in late life is considered a strategy used to adapt to age-related changes by maintaining a positive sense of identity and by distancing oneself from the stigma related to growing old, especially in cultures that devalue old age [24,29,32]. The effectiveness of this strategy has been empirically supported by studies finding that feeling younger than one’s chronological age is related to well-being and health over time [6,10,32,33,34]. Since the appearance of subjective aging in the literature, research has aimed to conceptualize, identify, and understand the pathways through which it is related to health. Westerhof and Wurm brought forth a heuristic model linking subjective aging, psychological resources, health, and survival within the individual and sociocultural context . Used to guide further research, this model hypothesized that subjective aging contributes to the accumulation of psychological resources, which in turn helps maintain good health . Today, accruing evidence supports this model by demonstrating that feeling younger than one’s age is associated with well-being and a range of positive health-related outcomes. To begin with, age identity has been demonstrated to be associated with facets of psychological well-being (PWB). Nearly 25 years ago, Ryff put forth a model of psychological well-being that offered a notable contrast in scientific research on well-being . The Ryff model introduced an eudaimonic approach to well-being, which in turn, centered around finding meaning, self-realization, and experiences of optimal growth [35,36]. The development of this integrated model of well-being drew on the union of life-span developmental theories, clinical theories of personal growth, and mental health perspectives . This model has been widely used by other investigations, to study well-being in response to various life challenges such as health changes of later life [35,38]. In fact, older age identity, that is feeling older than one’s actual age, has been associated with lower psychological well-being and higher levels of negative affect among middle-aged and older adults . Whereas younger age identity, feeling younger than one’s age is related to higher levels of life satisfaction, positive affect, lower risk of major depressive episode and higher chance of flourishing mental health [21,32,39]. In addition to having an effect on psychological well-being, subjective aging has also been found to impact older adult’s ability to perform activities of daily life. For instance, an experimental study of older adults induced a younger subjective age by providing positive feedback following their performance on a hand grip task . Results revealed that those who received feedback exhibited improved performance on the second-hand grip task as opposed to those who did not receive feedback . This study demonstrated that inducing a younger subjective age can promote physical functioning, a direct implication for improving functional health in late life. The 2008 Physical Activity Guidelines for Americans published by the U.S. Department of Health and Human Services (HHS) defined functional ability as “the capacity of a person to perform tasks or behaviors that enable him or her to carry out everyday activities”  (pg.13). Examples of functional health include ability to walk up a flight of stairs or carry groceries, and a compilation of studies have found that having positive perceptions of aging can promote these abilities. For example, Sargent-Cox, Anstey and Luszcz found that positive self-perceptions of aging had an effect on objective physical performance tests such as balance, gait, and rising from a chair over a period of 16 years in adults aged 65 and older . In a similar fashion, Levy, Slade, and Kasl found that adults aged 50 years and older with more positive self-perceptions of aging reported better functional health, such as ability to walk up and down stairs, than those with more negative self-perceptions of aging over an 18-year period . In fact, this effect was significant even after controlling for baseline measures of functional health, self-rated health, age, gender, race, and socioeconomic status . Furthermore, the Midlife in the United States (MIDUS) national study of health and well-being has also shown interest in this area of research as evident by the release of a newsletter titled “Subjective Aging”. This publication reported that Caucasians who felt older than their age reported more difficulties with basic activities, such as bathing and dressing as well as more strenuous activities such as carrying groceries and climbing several flights of stairs compared to those who felt younger than their age . In conclusion, the notion that positive self-perceptions of aging, such as feeling younger than one’s age, is beneficial to one’s psychological well-being and functional health in late life is well established in the literature; this association holds across diverse study samples and across different countries and cultures [10,21,44]. However, to the authors’ knowledge, there remains a paucity of published research that examines age identity among older adults of ethnic minority backgrounds in America. Therefore, to effectively meet the challenges of a rapidly growing segment of our population, better understanding of how this group experiences aging within the context of American culture is warranted. In order to address this paucity of ethnogeriatric research examining perception of aging among ethnic minorities in late-life in the context of a youth-centered culture, this current study utilized a socio-historic paradigm explored subjective aging, specifically age identity, in late life among African Americans, Puerto Ricans, Dominicans, and Mexicans in the United States. On the basis of the literature, it was hypothesized that ethnic minorities in late life felt younger than their chronological age. Given that all respondents live within the same cultural context, differences in age identity were not expected between ethnicities. Second, this study examined PWB and functional health in relation to age and age identity. A positive association between PWB and functional health was hypothesized. It was also hypothesized that respondents would feel younger the older they were. Moreover, it was predicted that feeling younger than one’s age would be associated with higher levels of PWB and functional health and that PWB would mediate the association between age identity and functional health. This study fills a gap in the literature by contributing to understanding the influence of age identity on psychological well-being and functional health, particularly among a sample that has been neglected in the field of subjective aging. This empirical study examined cases from the Midlife in the United States (MIDUS), Survey of Minority Groups. The survey was part of a larger project that aimed to investigate the patterns, predictors, and consequences of midlife development in the United States within the areas of physical health, psychological well-being, and social responsibility . In particular, the minority survey assessed the well-being of urban, ethnic minority adults who lived in Chicago and New York. The data was collected from 1995 to 1996 through structured interviews and included minority residents 25 years or older living in both hyper-segregated neighborhoods and in areas with lower concentrations of minorities. The data used for this socio-historic study is archival and a subset of the entire sample that was collected. Given the focus on late life, the sample only included respondents from ages 55 to 99 (N = 268, M = 64.79, SD = 7.957). Of the respondents, 54.9% were men and 45.1% were women. The ethnic minority groups represented were African Americans (34.7%), Puerto Ricans (39.2%), Dominicans (16.4%), and Mexicans (9.7%). Out of the 255 respondents who answered about their highest level of education, 25.7% of the sample reported some grade school education, 10.8% received anywhere between 6th and 8th grade education, 39.6% had high school education, and 19% having reported college or graduate level education. The current study utilized secondary MIDUS data collection which is reviewed and approved by the Education and Social/Behavioral Sciences and the Health Sciences IRBs at the University of Wisconsin-Madison. For additional information please refer to the MIDUS website at https://www.icpsr.umich.edu/icpsrweb/ICPSR/studies/2856/summary. Subjective aging has been conceptualized several different ways in the research literature . In the context of this study, subjective aging is measured using age identity, or the difference between one’s subjective (felt or perceived) age and one’s chronological age . One’s subjective age is usually measured with a single-item such as “What age do you feel?” . The participants in this study were asked “Many people feel older or younger than they actually are. What age do you feel most of the time?” The chronological age was obtained by examining date of birth. A variable was computed to capture the difference between participants’ chronological age and the age they feel most of the time. If the result yielded a positive value, then the participant felt younger than their chronological age, thus reporting a younger age identity. Conversely, yielding a negative value is interpreted as endorsing an older age identity, where a participant felt older than their chronological age. Psychological well-being was measured using Ryff’s theoretical framework, an approach that has been used within other studies of social factors and psychological well-being [47,48,49]. Ryff proposes six dimensions to measure psychological well-being: autonomy, environmental mastery, personal growth, positive relations with others, purpose in life, and self-acceptance. Each domain was assessed on a 7-point Likert scale using 3 items per domain, for a total of 18 items. Items were reverse coded as needed and scores were summed to form a single composite measure of psychological well-being, where higher scores represented greater levels of psychological well-being. Functional health, or one’s ability to perform activities of daily living, was measured averaging the seven-item Physical Functioning subscale of the SF-36 Health Survey, with higher scores indicating better functional health . The items related to the degree to which the participants’ health limits them in certain activities (e.g., lifting or carrying groceries, bathing or dressing, climbing flights of stairs). The structured interviews included basic demographic questions relating to age, gender, race/ethnicity, and education. Age was examined as a continuous variable. Gender was coded 1 for men and 2 for women. Race was coded into the four ethnicities represented: African Americans, Puerto Ricans, Dominicans, and Mexicans. Highest level of education was coded using four categories: Some grade school education, anywhere between 6th and 8th grade education, high school education, and college or graduate level education. The main objective of this empirical study was to investigate the effects of subjective aging on health in late life among four ethnic minority groups living in the United States. The aims were trifold: (1) To examine age identity; (2) to explore the association between age, age identity, psychological well-being, and functional health; and (3) to investigate whether the association between age identity and functional health is mediated by psychological well-being. Each of the study’s specific aims and their associated results are presented below. Descriptive statistics for these variables are available in Table 1. Table 1 Descriptive statistics for overall sample (N = 268). Do late-life African Americans, Puerto Ricans, Dominicans, and Mexicans who participated in the Midlife in the United States (MIDUS) Survey feel younger than their chronological age? Age identity was calculated by finding the difference between the respondents’ chronological age and the age they felt most of the time. Following the computation of age identity, frequency data revealed that on average, participants reported a younger age identity, that is, felt younger than their chronological age (M = 14.9, SD = 15.85). Does age identity of late life African Americans, Puerto Ricans, Dominicans, and Mexicans who participated in the Midlife in the United States (MIDUS) Survey differ as a function of ethnicity, level of education, and gender? A one-way between-subjects ANOVA was conducted to examine the effect of ethnicity on age identity among Puerto Ricans (M = 15.57, SD = 17.31), Dominicans (M = 15.14, SD = 13.54), African Americans (M = 15.04, SD = 15.42), and Mexicans (M = 11.61, SD = 15.33). No significant associations were observed between age identity and ethnicity or education. However, a significant difference in age identity was found between men (M = 16.67, SD = 15.08) and women (M = 12.82, SD = 16.6); t(266) = 1.99, p = .047. Are age and age identity related to psychological well-being and functional health? Bivariate correlations were conducted to examine the association between chronological age, age identity, PWB, and functional health. As expected, age and age identity were closely related, r(268) = .332, p < .01, demonstrating that the older an individual, the higher the discrepancy between chronological and felt age. In addition, there was a positive correlation between PWB and functional health r(268) = .155, p < .05. Younger age identity was associated with higher levels of psychological well-being, r(268) = .180, p < .01 and functional health, r(268) = .246, p < .01. However, chronological age was not statistically associated with PWB nor functional health (see Table 2). Table 2 Correlations between measures for overall sample (N = 268). Are age, age identity, and gender predictive of PWB and functional health? Two linear regressions were conducted to predict psychological well-being and functional health based on age, age identity, and gender to examine the predictive utility of age identity above and beyond these other predictors. Age identity significantly predicted psychological well-being (β = .14, SE = .06, p = .019), whereas age and gender did not. The second regression analysis found that age (β = -.01, SE = .003, p = .013), gender (β = -.12, SE = .04, p = .007), and age identity (β = .01, SE = .001, p < .001) were all significantly predictive of functional health (see Table 3 and Table 4). Table 3 Regression coefficients predicting functional health for (n = 268). Table 4 Regression coefficients predicting psychological well-being for (n = 268). Does PWB mediate the association between age identity and functional health? A mediation analysis was conducted following the recommendations of Preacher and Hayes to investigate the hypothesis that psychological well-being mediated the association between age identity and functional health . The mediation analysis controlled for gender and age as covariates. 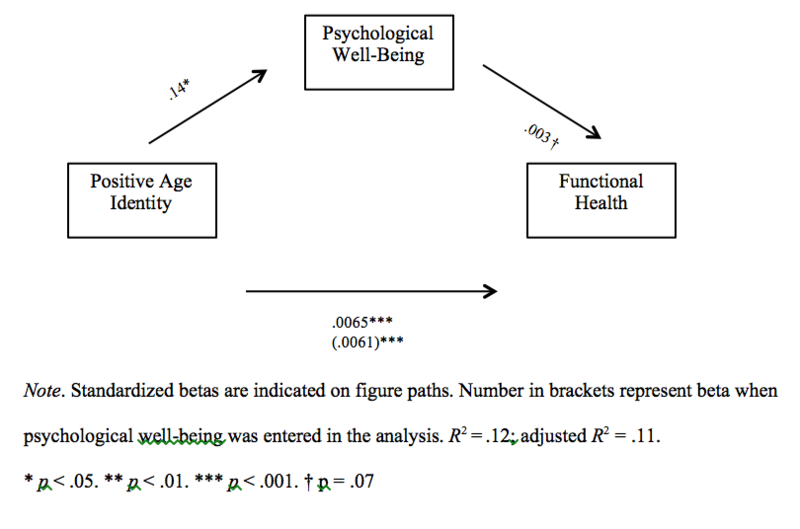 The analysis showed that age identity was significantly associated with psychological well-being, β = .14, SE = .06, p = .019, and that psychological well-being was marginally associated with functional health, β = .003, SE = .002, p = .069. Age identity was also significantly associated with functional health, β = .01, SE = .001, p < .001 (see Figure 1). Most importantly for the mediation analysis, bootstrap analyses revealed that the 95% confidence interval for the size of the indirect effects excluded zero (CI = .00001, .0012), indicating mediation . Thus, psychological well-being mediated the association between age identity on functional health. Approximately 12% of the variance in functional health was accounted for by the predictors (R2 = .12) (see Figure 1). Figure 1 Psychological well-being as a mediator of younger age identity on functional health. The main purpose of this study was to explore age identity in late life among individuals from four ethnic minority groups in the United States, a neglected area in the subjective aging literature. The present study has six major findings. First, individuals aged 55 and older of African American, Puerto Rican, Dominican, and Mexican backgrounds felt younger than their actual age. However, when taking into account their specific ethnic background, no differences were found. Given the cultural context, this finding illustrated the adaptive value of feeling younger in America, a youth-centered society . In addition, this study showed that getting older was associated with feeling younger. This is not surprising, considering the evidence that the discrepancy between felt and chronological age increases as individuals age [18,52]. Individual factors such as a motive to maintain a consistent and positive self-concept is an assimilative strategy that can help explain this discrepancy . Second, the existence of gender-related differences in age identity is unresolved in the literature. Some studies have found that woman report greater discrepancies than men, whereas others have shown that men perceive themselves as younger more often than women [16,53]. To further emphasize the mixed results, some studies did not find any gender-related differences . Nevertheless, this study revealed that in late life, ethnic minority men felt younger than ethnic minority women. Culturally-specific factors may play a role in this finding and therefore merits future consideration. For example, machismo, a strong sense of masculinity that is related to a man’s responsibility to protect and defend his family, could be considered . Men with traditional gender identities tend to avoid situations in which they perceive themselves as helpless or weak, thereby the process of aging can result in a loss of machismo [55,56]. As a result, feeling younger than their age can be understood as a way of coping that facilitates avoidance of age-related loss in men of ethnic backgrounds . Third, this study found that younger age identity was associated with higher levels of psychological well-being and functional health, whereas chronological age was not. This finding highlights the importance of age identity over chronological age in late life, which has direct implications for clinicians working with this population. In essence, simply asking a person’s chronological age does not suffice. Assessing for an individual’s perception of their own aging, such as by asking how old they feel, may reveal valuable information about the older adult’s resilience and vitality if conducted in a manner that belies a dynamic understanding of the lived experiences of older adults. Another important point is that therapists should be cognizant of the way they communicate with this population to avoid engaging in ageist remarks that may influence the way their patients perceive their age. Fourth, this study showed that age, gender, and age identity all predicted functional health, but only age identity predicted PWB. Age and gender are generally fixed; therefore, age identity seems to be the most feasible as a mean to promote functional health. Moreover, the strong predictive nature of age identity on both functional health and PWB demonstrated that one’s perception of aging has a strong influence on successful aging. The fifth main finding revealed that psychological well-being also predicted functional health. This implies that promoting access to psychological services for older adults is an arena for advocacy. Moreover, these findings imply that solely treating physical ailments would be an injustice to the overall health of this population, and as a result, health professionals should be advised to refer their patients to seek psychological services when deemed necessary. Lastly, as expected, PWB mediated the association between age identity and functional health. In short, the power of perception in late life is monumental in predicting facets of well-being and health. These results have numerous implications for clinicians working with this population and researchers interested in advancing the field of geriatrics. Ultimately, future intervention research on leveraging age identity and promoting positive perceptions of aging within individual and sociocultural contexts is warranted. Some limitations of the study should be noted. Self-report measures were used for all variables, and the associations between variables could be affected by a common measurement bias. Yet, psychosocial variables such as psychological well-being are typically measured using self-report, given the focus on perceptions and expectancies . It is difficult, if not impossible, to include an objective measure of age identity because the nature of the construct is based solely on perception. However, future research can incorporate performance-based measures such as gait tasks to objectively assess functional health. Given that functional ability is only one area of health, future research is encouraged to explore the implications of younger age identity on other areas, such as physical health. Moreover, given the complexity of subjective aging, many argue that youthful age identity is only one aspect of the aging self. However, despite relying on a single-item measure, age identity ratings have shown considerable predictive validity and remain important in making strong empirical predictions in subjective aging research . Future studies should examine other conceptualizations of subjective aging to establish stronger empirical foundation for the use of multidimensional versus unidimensional approaches and vice versa. In addition, regardless of the model or definitions used, most studies are based on researchers’ conceptualizations and measures of successful aging and relatively few studies have addressed aging well from the perspective of older adults, especially those in minority groups. This is a concern, given the magnitude of projected population increases in ethnic minority groups in late-life by the mid-century. Another limitation was the cross-sectional nature of the study and the use of historic data. While adding to greatly underexplored area, namely subjective aging in ethnic minorities in late life, the population assessed has likely already entered late life with many in the old-old category based on the latest census data. As such, future research should reexamine the population to better understand the nature of this relationship over time through longitudinal and intradindividual inquires thus increasing understanding of the variability and temporal relationship between age identity, functional health and psychological well-being. This would also allow for a current and more dynamic view of subjective aging. The issue of generalizability in terms of what the federal government considers “ethnic minorities” was another limitation. Lack of data collected on American Indians, Alaska natives, Asians, and Pacific Islanders prevents the findings to be considered inclusive of ethnic minorities in the United States . Consequently, in order to prepare for the ethnogeriatrics imperative, examining subjective aging among these previously stated populations is a potential area of future research. Moreover, taking a closer look at culture-specific values that may influence successful aging, specifically age identity, lends itself to future avenues within the realm of subjective aging in ethnic minorities. Lastly, this study did not take into consideration acculturation status, that is the process by which immigrants adapt psychologically and behaviorally to new sociocultural environments . Based on the findings of this study, it is expected that subjective aging is less important for ethnic minorities from cultures that value the elderly, if they have not assimilated as strongly into US culture. In other words, ethnic minorities in late who have acculturated, may value youthfulness more than those who have recently arrived in this country or have assimilated to a lesser degree. In order to support this prediction, future research should aim at captivating the effects of acculturation status on the perceptions of aging and late life in ethnic minorities in the US. Given the unprecedented rise in ethnic minorities reaching old age in the United States, new ways to promote physical and psychological well-being is warranted. Across multiple samples, cultures, and countries, studies have found that subjective aging is an important predictor of health and a viable psychological process used to adjust to challenges in late life. The current study adds to that body of research by showing that subjective age identity can influence levels of psychological well-being and functional health in ethnic minority older adults. As the research on subjective aging is limited in regard to the ethnic minority population in the United States, the hopes of the authors is that the current study guides future inquiry and general public health initiatives. The authors would like to thank the participants who participated in the Midlife Development in the United States Study (MIDUS), Survey of Minority Groups. Dr. Argüelles-Borge contributed to the design and revisions of the manuscript. Dr. Stripling contributed to the revisions, format and submission of the manuscript. Dr. Brochu contributed to the revisions, design, and statistical data analysis presented in the manuscript. He W, Goodkind D, Kowal P. An aging world: 2015. Washington: U.S. Census Bureau; 2016. Vespa J, Armstrong DM, Medina L. Demographic turning points for the United States: Population projections for 2020 to 2060. U S Census Bureau Curr Popul Rep. 2018; P25-1144. Centers for Disease Control and Prevention. The state of aging and health in America.Atlanta: Centers for Disease Control and Prevention, US Department of Health and Human Services; 2013. Ortman JM, Velkoff VA, Hogan H.An aging nation: The older population in the United States. U S Census Bureau Curr Popul Rep. 2014; P25-1140. Havighurst RJ, Albrecht R. Older people. Oxford: Longmans, Green; 1953. Gergen KJ, Gergen MM. The new aging: Self-construction and social values. New York: Springer; 2000. p. 281-306. Fry CL. Handbook of aging and the social sciences. 4th ed. San Diego: Academic Press; 1996. P. 117-136. Westerhof GJ, Whitbourne SK, Freeman GP. The aging self in a cultural context: The relation of conceptions of aging to identity processes and self-esteem in the United States and the Netherlands.J Gerontol Ser B Psychol Sci Soc Sci. 2011; 67: 52-60. Westerhof GJ, Miche M, Brothers AF, Barrett AE, Diehl M, Montepare JM, et al. Meanings of ageing and old age. London: Sage Publication; 2007. Ryff CD, Singer BH. The exploration of happiness.Springer: Dordrecht; 2008. p. 97-116. Morales E. Lesbians and gays in couples and families: A handbook for therapists. San Francisco: Jossey-Bass; 1996. p. 272-297. Villereal GL, Cavazos Jr A. Shifting identity: Process and change in identity of aging Mexican-American males. J Sociol Soc Welfare. 2005; 32: 33-42.